We’d love your help. Let us know what’s wrong with this preview of Moondial by Helen Cresswell. A time travel book. Or is it a haunting? Minty believes she is a witch - not the type you would notice ordinarily - - she appears to be like anyone else but is quite used to seeing phantoms floating about the place, and thinks it is perfectly normal. Minty is very determined as well, which is just as important because when she goes to stay with her aunt in the village of B A time travel book. Or is it a haunting? Minty believes she is a witch - not the type you would notice ordinarily - - she appears to be like anyone else but is quite used to seeing phantoms floating about the place, and thinks it is perfectly normal. Minty is very determined as well, which is just as important because when she goes to stay with her aunt in the village of Belton she soon realizes that she has a task to do. . .
To ask other readers questions about Moondial, please sign up. Most of the points I'm giving this book are from my childhood self - it was my favourite, and a book that really inspired my writing. It's so strange and atmospheric and mysterious. Unfortunately upon re-reading, it's a bit *too* mysterious. Very few of the questions it sets up are answered, and some intriguing points that seem like a big deal are never again mentioned or explained. It feels more like someone telling an intriguing bedtime story that they're making up as they go along than like so Most of the points I'm giving this book are from my childhood self - it was my favourite, and a book that really inspired my writing. It's so strange and atmospheric and mysterious. Unfortunately upon re-reading, it's a bit *too* mysterious. Very few of the questions it sets up are answered, and some intriguing points that seem like a big deal are never again mentioned or explained. It feels more like someone telling an intriguing bedtime story that they're making up as they go along than like something that could be reality. This story follows the saga of Araminta (or Minty for short), who has discovered she has a strange talent for seeing ghosts. After her mother is involved in a car accident, Minty is sent to stay in the country with an elderly Aunt who lives on the grounds of an old stately home now open to the public. Whilst staying with her Aunt, Minty befriends a local groundskeeper called World who informs her that she must help the past residents of the home find peace as they are lost souls. Minty meets the This story follows the saga of Araminta (or Minty for short), who has discovered she has a strange talent for seeing ghosts. After her mother is involved in a car accident, Minty is sent to stay in the country with an elderly Aunt who lives on the grounds of an old stately home now open to the public. Whilst staying with her Aunt, Minty befriends a local groundskeeper called World who informs her that she must help the past residents of the home find peace as they are lost souls. Minty meets these residents through some form of ghostly vortex which is triggered by the garden sundial that only seems to work in moonlight. These residents include a young stable hand by the name of Tom and a former resident with an unfortunate birthmark who spends her days hiding and her nights being taunted by neighbourhood children. The introduction of a sinister local ghost hunter with multiple personalities through time adds drama and a twist ending to this book. This was a fantastic read and I highly recommend this. It is a more laid back interpretation of some of the more classic ghost stories with a sentimental theme of love for your fellow humans and respect for the past. Minty’s mother returning from hospital well again to collect her provides a happy ending that is satisfying to read. This book would be suited to children aged 8-11 who have a more advanced reading age, and could be used as a story to read aloud to the class by the teacher or for private reading. My first reading of this enchanting novel, in preparation for the 2017 Newark Book Festival and the panel discussion on Nottinghamshire's literary heroes. Helen Cresswell is certainly one such hero. This is a novel reminiscent of Philippa Pearce's 'Tom's Midnight Garden', engaging with time slips and ghostly figures from the past and the future. The authorial voice is fully aligned with the main protagonist, Minty Kane, affording the reader the clearest insight into Minty's thoughts and feelings, as she resists the often cold indifference of some adults to fulfil her destiny to change lives for the better. It is kind of a horror story about a girl going back in time. Every night, she went to the garden where there is a moon dial and she went back in time to meet a boy from many years ago and a girl. I really enjoyed this book. This is February's children classic choice from Victoria from booktube channel Eves Alexandria. This was a highly nostalgic re-read for me - all the time travel fantasies of my childhood came flooding back. After reading this story of ghosts, time slip and bravery for the first time I was surprisingly keen to go visit country houses. It's not every 8 year old that wants to go to Chatsworth for her birthday but I was determined to have an adventure like Minty's. Now as an adult I really appreciated how atmospheric and spooky the book was, and how Minty dealt with complex and frightening sce This was a highly nostalgic re-read for me - all the time travel fantasies of my childhood came flooding back. After reading this story of ghosts, time slip and bravery for the first time I was surprisingly keen to go visit country houses. It's not every 8 year old that wants to go to Chatsworth for her birthday but I was determined to have an adventure like Minty's. Now as an adult I really appreciated how atmospheric and spooky the book was, and how Minty dealt with complex and frightening scenarios including abuse and death. I felt the ending was a bit abrupt and it wasn't clear how the conflict at the heart of the story was resolved, but it still had a powerful message. I owned this book in the 1990's & even watched the TV show. The story of Minty, Tom & Sarah is one of my all time favorites & has never left me. I decided to re-read this on a whim, and I still think it's brilliant some 25 years later! It's one of those stories that is timeless and filled with intricacies. Everyone should read this book, children & adults alike, you will not be disappointed. Its about a girl travelling through time to help a boy and a girl from the past. She uses the moondial to help her travel. I really like this type of book and its suits me well. Although i dont know the "type" of this book. "Light and Shadow by turns, but always Love"
This was a favourite BBC drama of mine, a wonderfully atmospheric tale, and I have to confess Siri Neal in the lead role was a major attraction! It's stuck in my memory ever since, so I thought I'd read the book. I'm sure I've started it in the past, but never got around to finishing it. Lead character Minty, a girl who recently lost her father, goes to spend the summer with an old aunt at Belton, a grand old country house. Her mother is involved in a c "Light and Shadow by turns, but always Love"
Lead character Minty, a girl who recently lost her father, goes to spend the summer with an old aunt at Belton, a grand old country house. Her mother is involved in a car accident after dropping her off, and for much of the story she's in a coma. Minty has to deal with this, as well as her discovery of ghosts in the grounds of the house. She discovers a way to travel back in time, and encounters two children from different eras. The book is short, and the plot is simple, but it's a beautifully mysterious and atmospheric read, with a big dollop of nostalgia in it for me. Belton is a real house, and the Moondial of the story is a real thing in the grounds, so I think one day I'm going to have to visit and see it. A nice children's time travel novel with a great female protagonist. I particularly liked the character of Tom short for Teddy. I'm pleased to say that the BBC TV adaptation from the 80's is equally as good as the book. This review has been hidden because it contains spoilers. To view it, click here. I have a vague recollection of being 7 years old, coming home from school and watching a terrfying kid's tv show in which a young girl with a birthmark on her face cannot look in a mirror for fear she'll summon the devil. I knew there was a sundial central to the story, but didn't know much else about it - and couldn't find anyone else who remembered it, until I met Alysa. Alysa loaned me her copy of the book and I devoured it in one sitting. It's a classic children's time travel story, a lot les I have a vague recollection of being 7 years old, coming home from school and watching a terrfying kid's tv show in which a young girl with a birthmark on her face cannot look in a mirror for fear she'll summon the devil. I knew there was a sundial central to the story, but didn't know much else about it - and couldn't find anyone else who remembered it, until I met Alysa. Alysa loaned me her copy of the book and I devoured it in one sitting. It's a classic children's time travel story, a lot less terrifying than I remember on the one hand, but on the other, no doubt very scary from a child's perspective. There are elements that disappoint - such as the lack of a confrontation with Miss Raven, and others that delight - the revelation that the figures entwined around the moondial are eros and chronos, names lost on most children but suddenly obvious to adult readers. Despite the disappointments, the book stands up to a nostalgic revisit as an adult reader. This is one of my favourite stories - I loved the BBC adaptation when I was younger. So, it was impossible to resist when I saw this book in the local Library sale. It is the story of Minty, packed off to her Aunt's during the Summer holidays. She feels that there is something wrong about the house and gardens where she spends her days. Then her mother is involved in a car accident and Minty discovers the Moondial - both events become entangled as she ends up travelling back through time, meeting This is one of my favourite stories - I loved the BBC adaptation when I was younger. So, it was impossible to resist when I saw this book in the local Library sale. It is the story of Minty, packed off to her Aunt's during the Summer holidays. She feels that there is something wrong about the house and gardens where she spends her days. Then her mother is involved in a car accident and Minty discovers the Moondial - both events become entangled as she ends up travelling back through time, meeting two children who need her help. Tom, the young servent who wants to be a footman but suffers from consumption, and Sarah, who hides a devilish secret beneath her hood. Reading this as an adult, thought it was a good story. Quite creepy in places. Probably would have scared me as a child haha. Reminded me of the TV series called "ghost hunter" I think it was called that was on in the early 90s. This has been one of our recent bedtime stories, chosen by me, due to a memory of me watching this story on television,many moons ago. I thought this would be a perfect autumn/Halloween read as it's full of mystery,ghosts,time travel and a chillingly mean witch. So my son has been dragged along with me while I reminisced early childhood memories! Araminta Kane lives with her mum Kate. Her Dad has just died and Kate needs someone to look after Minty during the long school holidays,so Min This has been one of our recent bedtime stories, chosen by me, due to a memory of me watching this story on television,many moons ago. I thought this would be a perfect autumn/Halloween read as it's full of mystery,ghosts,time travel and a chillingly mean witch. So my son has been dragged along with me while I reminisced early childhood memories! Araminta Kane lives with her mum Kate. Her Dad has just died and Kate needs someone to look after Minty during the long school holidays,so Minty is sent to live with her godmother Aunt Mary who lives in a cottage opposite Belton House, an old national trust property. Minty, who is not entirely pleased to be sent away from her home and mother, explores the grounds of Belton House and comes across a sundial which, when the time is right, can transport people back through time and so the adventure begins. Will Minty solve the mystery of the ghosts she meets along the way? Or will the evil Miss Raven get to them first? Will Minty be trapped in time forever? So, a bit of nostalgia for me and I think I enjoyed this story more than my son did! That's not to say he didn't enjoy it, I was just more invested in it I guess. The writing was evocative. I could imagine myself going back in time and finding ghosts. It was quietly spooky and very descriptive. If you have ever visited any National Trust building you would instantly know how Belton House was,all formal gardens and rooms full of ancient history, it made it interesting then to go back to when the house was a working house bustling with servants. The characters were great! Minty...strong and feisty but so worried about everyone around her. Sarah...the little ghost girl whose life is made a misery by her cruel governess and her peers that bully her unrelentlessly because she has a birthmark on her face. Kind,gentle Aunt Mary, even she is wary of Miss Raven in the end. Kate, a single working mum, trying to do her best for Minty in a difficult situation. Haughty, cold, sinister Miss Raven, a true villain! World, the gardener, oh you have to love World and his words of wisdom! And last but not least Tom or Teddy Larkin as was his proper name. I adored Tom. The love he had for his little sister Dorrie, his ambition to be a footman instead of a lowly kitchen boy. This is the first book I ever read more than once. I really didn't realize how much I enjoyed science fiction as a child! I'm giving this five stars because I remember loving the book in my youth. I haven't read it in ages, but I remember the events of the story well enough. The writing was probably juvenile, but I didn't mind when I was young. Lovely little children's book. I loved the tv series based on the book when I was younger and being able to visit Belton House and see the dial for myself as it was not far from our home. I didn't read the book until this year though and it was just as good as thought it would be. Lovely self contained short fantasy story, engaging characters, heart warming but not saccharine sweet. I also really liked he inclusion of traditional nursery rhymes, a lot of which I'd forgotten I knew! 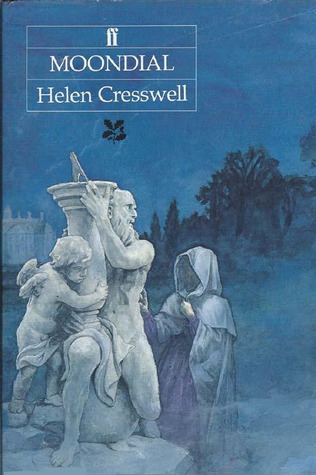 Moondial by Helen Cresswell is a children’s book about ghosts, time travel and connections to the past. I picked up this book in Waterstones earlier this year along with a beautiful hardback edition of The Spiderwick Chronicles, right after I’d been trying to get myself to stop buying books I hadn’t read yet that weren’t from a series/author I already liked, in case I end up hating them. 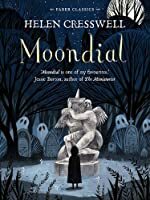 I felt like I could let myself buy something else since I’d only found one other book for once, and I really l Moondial by Helen Cresswell is a children’s book about ghosts, time travel and connections to the past. I picked up this book in Waterstones earlier this year along with a beautiful hardback edition of The Spiderwick Chronicles, right after I’d been trying to get myself to stop buying books I hadn’t read yet that weren’t from a series/author I already liked, in case I end up hating them. I felt like I could let myself buy something else since I’d only found one other book for once, and I really loved this cover so I decided to take a risk. It was a risk that definitely paid off. I wasn’t entirely sure what to make of it at first, but it didn’t take me long to become really immersed in the story. The structure of the narrative worked well for the kind of story it was and I felt like the pacing complemented it and helped the story’s general flow. I loved the descriptions most of all, and how atmospheric and perfect they were. The dialogue was enjoyable to read too – I especially liked Minty’s regular words of assurance to herself. As well as being very fitting and consistent with her character, it was a really nice touch to see some of her thoughts spoken aloud as she was cheering herself on and keeping herself going. The book was haunting and sinister and the writing absolutely pulled off creating that atmosphere. In spite of that, I still felt like it had a lot of warmth to it too. I think it was because of Minty’s determination to help Tom and Sarah, as well as the connection her adventures had with her mother in hospital and how she would relay them to her in the hopes of the stories helping her get better. How much Minty cared about those three was very prominent to me – when she put herself in danger in the middle of the creepy goings on it was to help her friends and her mother, and that gave the actions more impact. Those aspects didn’t just add another layer to the story, they worked well with and complemented the horror elements of the book too. Many of the mysteries weren’t fully explained, and that can be a real hit or miss in a story for me. Sometimes I love having that space to theorize, or occasionally to just accept some parts being left open, but other times it leaves the story feeling lacking. Moondial didn’t exactly feel lacking to me, but I did want more from it and wouldn’t have said no to some more clues and/or explanation in certain places. I’d never read Moondial before but I’m very glad I took a chance and bought it. It was a haunting yet warming story, despite the focus on ghosts and mysteries in the dark, and that, to me, was what made it all the more magical. Review originally posted on my blog. This was a simple story that was too drawn out. The writing style tended to be cumbersome and at times confusing (making me wonder whether the targeted audience was appropriate). The idea was good, but it could have been executed better. Who is World? How does he know stuff? Is Miss Raven really the same person as from the past? Where do the kids *go*? They clearly still stayed in their lives as there's a gravestone - how were their lives improved? Were they?